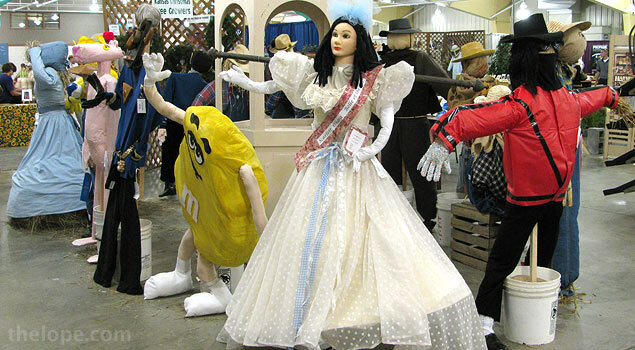 During the Kansas State Fair, the Pride of Kansas Building holds entries in various agricultural contests, as well as one display that makes a bit of news every year - the butter sculpture. 2009's butter sculpture was of a man trying to shoe an uncooperative horse. I must admit that I still don't understand the source of the man's obviously pained expression, and each time I saw it, people around me didn't understand either. Maybe he is strained by pulling the horses leg up? This is probably one of those cases of "city boy doesn't get it." Sharon BuMann of Central Square, New York, did this year's sculpture using 1,275 pounds of the butter. 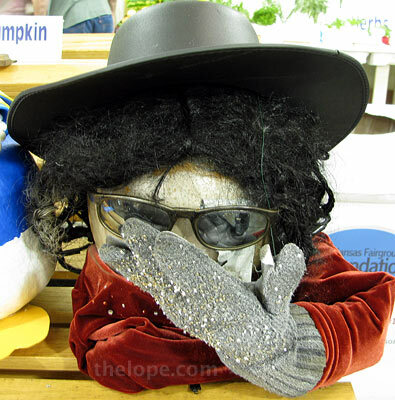 There's a celebrity or personality scarecrow category. I view the entries as a sort of pop culture barometer. For example, there were no pirates this year. 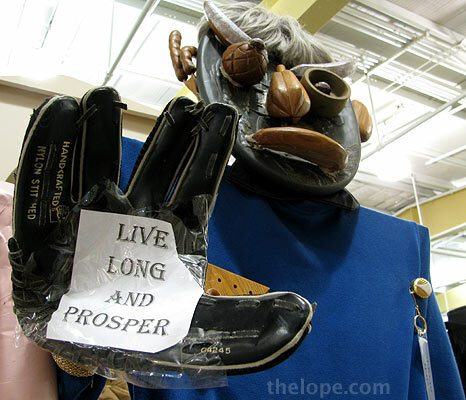 Kay Towle of Hutchinson made this scarecrow of Mr. Spock from the original Star Trek series. My favorite thing in the whole building was this scarecrow of an older Spock, brought by Katherine Moeckel of Plevna. Her improvisation in the selection of parts was...fascinating. The face, made up of wooden fruit, reminds me of the fruit-faced paintings of sixteenth-century Italian artist Giuseppe Arcimboldo. 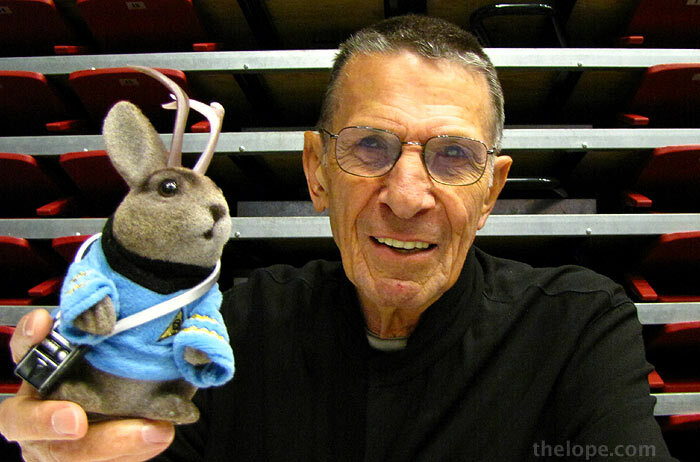 Leonard Nimoy seems to be amused by unusual homages and might appreciate this rendition. Ace just had to pose with this one. 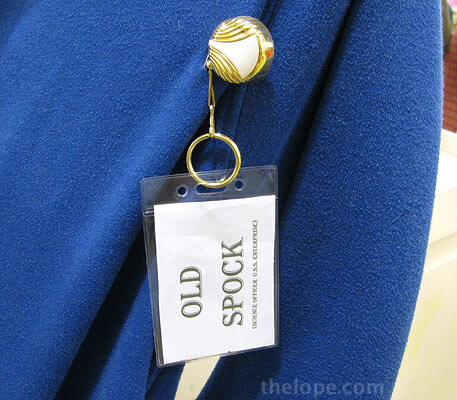 I'm not sure how Mr. Nimoy would take to being called "old Spock." 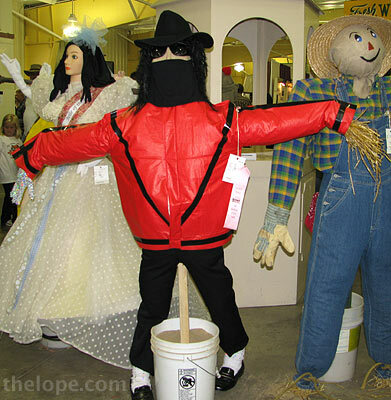 Teresa Rife of Nickerson envisioned Michael Jackson as a scarecrow. Jackson was also represented as a pumpkin by Leanna Woleslagel of Hutchinson. 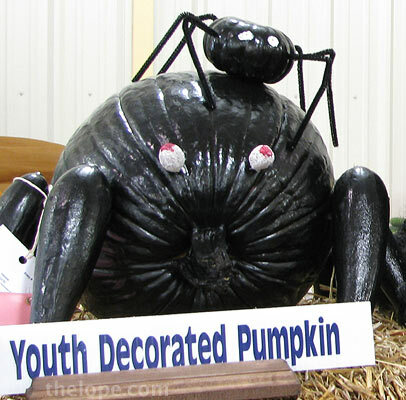 Austin Phillips of Hutchinson brought this pumpkin decorated as a spider. Thanks, Mr. Phillips, for helping usher in the Halloween season. 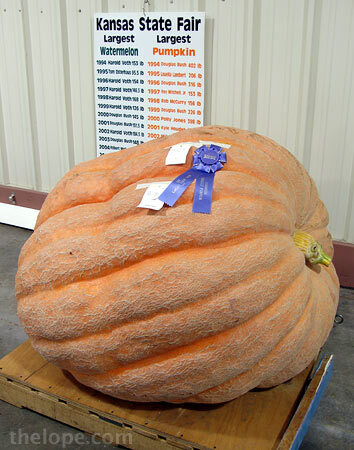 If you don't like anthropomorphic pumpkins but do like big ones, you might have enjoyed the largest pumpkin - 834.2 pounds - brought by Doug Armstrong. 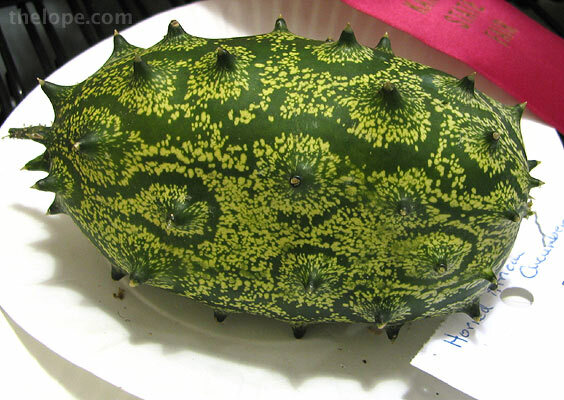 This moon and stars watermelon was part of a set of watermelons brought by Ron Olavarez. 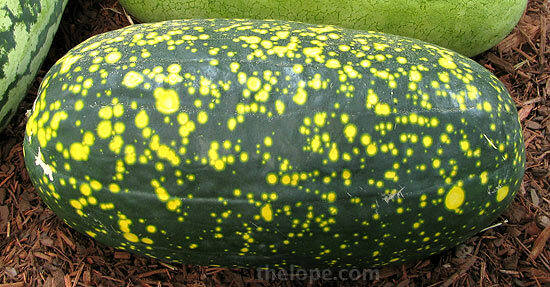 The horned African cucumber caught my eye. It looks like pollen as seen under an electron microscope. It was brought by Leland Headings of Hutchinson. 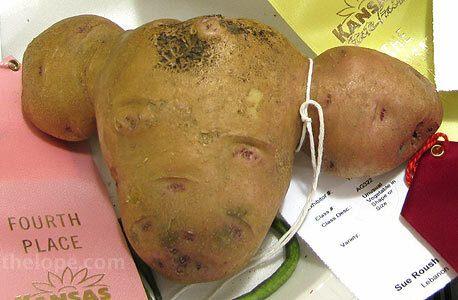 Sue Roush of Lebanon brought this potato, which reminds me of former jobs working at newspapers when I'd be dispatched to someone's house to photograph potatoes that looked like dead presidents. Grover Cleveland actually came up once in this regard, which still causes me to wonder: who walks around with a mental template of what Grover Cleveland looked like? Anyway, this one looks like a dog with eye placement by Picasso. 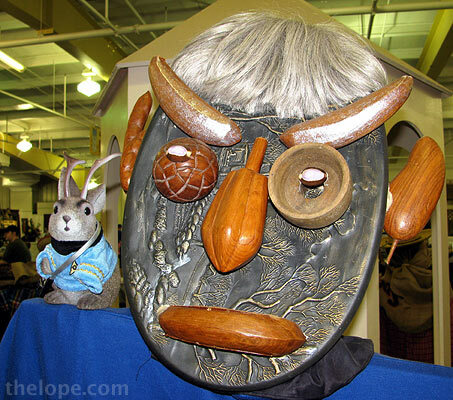 Ahh, the Kansas State Fair - folksy, artsy and darn amusing. 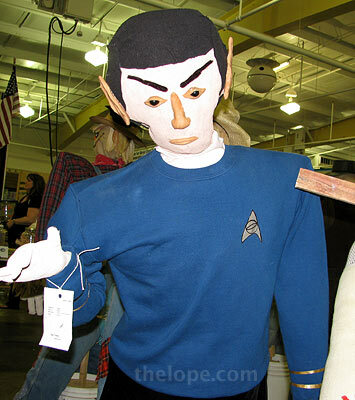 Hi, I just saw your mention of my Old Spock scarecrow, thank you! I was making him to reflect the old Spock on the latest STar Trek movie! "I Wonder Whose Car This Is?"